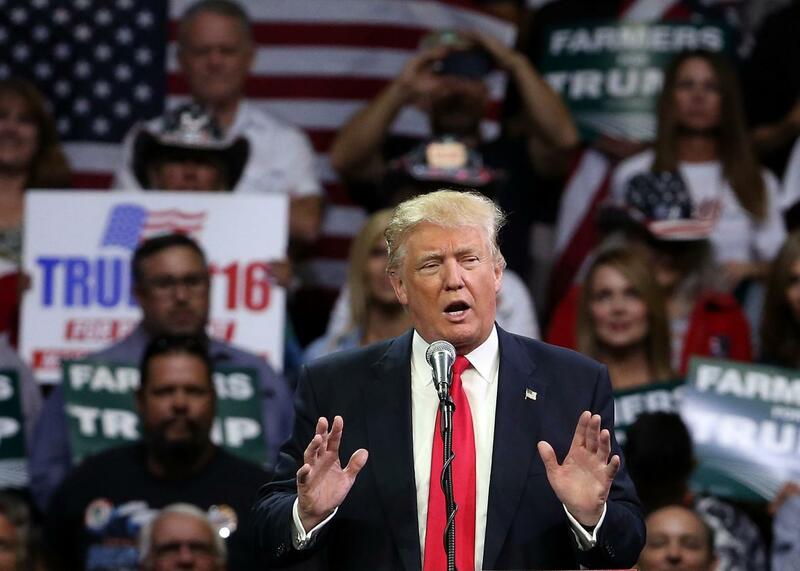 Donald Trump speaks at a rally in Fresno on May 27 in Fresno, California. Throughout the litigation my attorneys have continually demonstrated that students who participated in Trump University were provided a substantive, valuable education based upon a curriculum developed by professors from Northwestern University, Columbia Business School, Stanford University and other respected institutions. Nor did Trump address claims that that many of the Trump University instructors were a mix of motivational speakers and less-than-successful housing-market investors. And, the response from students was overwhelming. Over a five-year period, more than 10,000 paying students filled out surveys giving the courses high marks and expressing their overwhelming satisfaction with Trump University’s programs. The truth: More than 80,000 people attended the free informational session offered up to entice them to pay $1,495 to attend a three-day session of Trump U. A little more than 9,000 bit. Then fewer than 1,000 went on to pay up to $35,000 for advanced training. Clearly, most people didn’t fill out any sort of survey at all. As for those who did, more than a few felt coerced into providing positive ratings. Reports abound about teachers who demanded positive ratings. The New York Times, for example, reported that Trump University attendees not only rated teachers in front of the teachers (pressure much?) but that course completion certificates would be withheld from people who didn’t fill out the evaluation. Trump did not address that allegation in his statement. As for Bob Giullo, another frequent Trump critic who claimed on paper to have found Trump University worthwhile? He told the New York Times his instructor told him he would lose his job if he didn’t get a glowing review. For those students who decided that Trump University’s programs were not for them, the company had a generous refund policy, offering a full refund to any student who asked for their money back within 3 days of signing up for a program or by the end of the first day of any multi-day program, whichever came later. What Trump doesn’t say? Almost 40 percent of the enrollees received refunds. That’s a seriously high dissatisfaction rate. Also, some people—like Kathleen Meese, a teacher and the mom of a son with Down syndrome who spent upward of $25,000 on Trump U classes—wanted a refund but couldn’t receive one. Nor does he mention allegations that people attending the sessions were urged to take on credit card debt to pay for the classes. Due to what I believe are unfair and mistaken rulings in this case and the Judge’s reported associations with certain professional organizations, questions were raised regarding the Obama appointed Judge’s impartiality. Then there is Curiel’s membership in the San Diego La Raza Lawyers Association. Apparently, Robbins Geller Rudman & Dowd, a law firm representing the plaintiffs in the case, sponsored a gathering of the San Diego La Raza Lawyers Association back in 2014. The firm also paid both Bill and Hillary Clinton to speak in recent years. As far as I can tell, Trump’s implication is the one going around certain right-wing outlets known for conspiracy-type thinking: that Curiel is suspicious because of his ancestry and is acting as a faithful servant of these groups, not an impartial judge. Do you really need me to address this? While this lawsuit should have been dismissed, it is now scheduled for trial in November. I do not intend to comment on this matter any further. Keeping quiet and exercising impulse control is not Trump’s strength. So no doubt this last claim will be proven false within the next few days. Read more in Slate about Trump University.